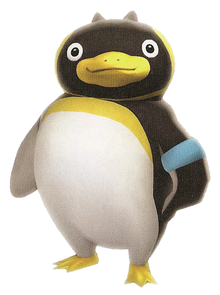 The Coach is a tall black penguin that appears in Super Mario Galaxy and Super Mario Galaxy 2. He is a swimming instructor in the Beach Bowl Galaxy in Super Mario Galaxy, who gives advice as to the location of one of the Power Stars in that area. He can be found teaching the other penguins how to use a shell to improve their swimming. The Coach first appeared in Super Mario Galaxy. He can be found in the Loopdeeloop, Beach Bowl and Loopdeeswoop galaxies. The Coach is the instructor of his own swimming class in the Beach Bowl Galaxy. He appears in all of the missions, though his roles are more or less minimal. In the Sunken Treasure mission, he tells Mario that his students are being distracted by "sparklies," and sends Mario to collect them. In the second mission, Passing the Swim Test, the Coach offers Mario a chance to get a Power Star if he collects a Gold Shell and brings it to him. His role is greatly diminished for the third mission, where he only tells Mario not to break the wall to the undersea cavern. In the purple coin mission, he tells Mario that his class is having free time and wants Mario to play nice. The Coach is also the instructor of ray surfing in the Loopdeeloop Galaxy and Loopdeeswoop Galaxy. If Mario manages to surf on Ray to the end of the water course, he is then awarded with a Power Star. The Coach appears in Super Mario Galaxy 2, in the Cosmic Cove Galaxy. The only difference in his physical appearance is that the bands on his arms are blue, rather than red. In this game, the Coach only appears in two missions, Twin Falls Hideaway and Exploring the Cosmic Cavern. In the former, the Coach would tell Mario that he is the swimming coach and that his students are all out in the water swimming; while in the latter, he informs Mario that there is a Luma trapped in a cage and that everyone is out looking for the key to open it. Once again, his role is minimal in the game.